CreaTiff Chatter: Let's Talk About Music: OJ: GUILTY!!!! 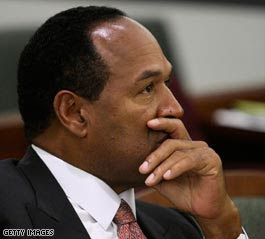 Tiffany: 13 years to the day of his acquittal for murder, OJ just minutes ago was found guilty of all 12 counts. See details from CNN below. LAS VEGAS, Nevada (CNN) -- The jury has reached a verdict in O.J. Simpson's armed robbery and kidnapping trial in Las Vegas, Nevada, a defense lawyer and a court official said Friday. The jury reached the verdict 13 years to the day O.J. Simpson was acquitted of two murders. Simpson arrived at the Clark County Justice Center at around 10:50 p.m. (1:50 a.m. Saturday ET). The verdicts were expected to be read once all of the lawyers and defendants arrived in the courtroom.